James Harden is dribbling up to the left wing as the Houston Rockets are down three with 48 seconds left. Kevin Durant calls off Andre Iguodala. He wants to guard his former teammate in one of the most intense moments of this season. Durant, one of the longest wing defenders this league has ever seen, picks up Harden about 35 feet from the rim. His arms are already raised to prevent even the longest 3s Harden might consider. But it's not Durant's arms that Harden is focused on -- it's his Nikes. As the pair arrives at the 3-point line, Harden invites his old friend to dance. Harden crouches into his coil and begins to break down Durant. It won't take long. He's about to tie the game with the definitive move of the season. Harden uses a left-handed dribble to edge toward the 3-point line. With exactly 46.0 seconds remaining, the ball has bounced back up into Harden's hand. He's done dribbling, but his unhurried demeanor still gives no hint that a split-second later he's going to bury the game-tying 3 in KD's face. 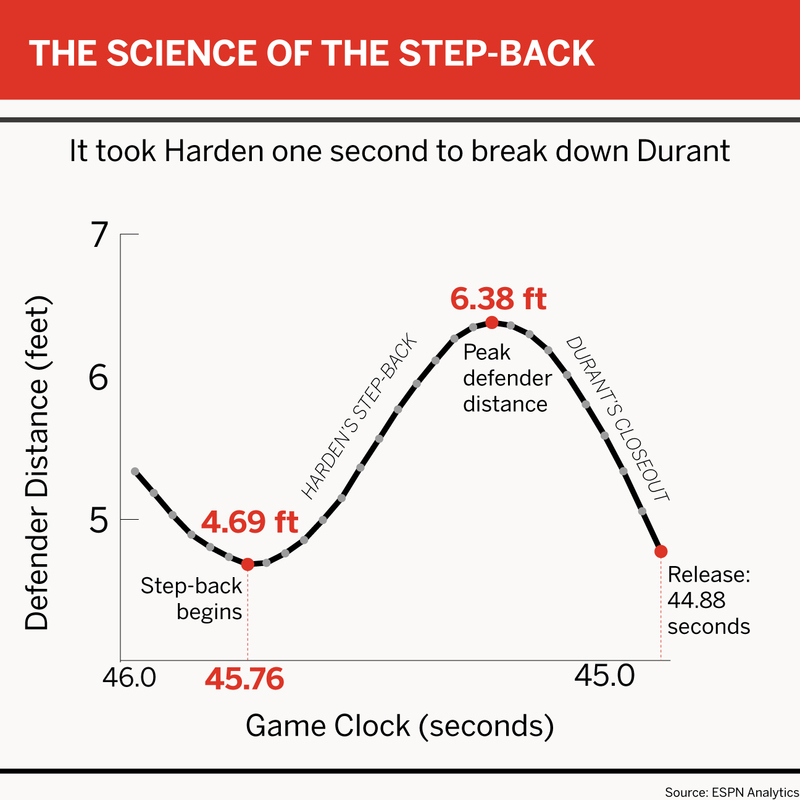 By the time the clock reads 45.7, Harden has already destroyed Durant's defensive stance and laid the groundwork for the shot that will tie the game. Harden lurches his left foot forward and suddenly jerks his body as if he's going to penetrate. But his back foot hasn't even moved. His stance is widening, and instead of dribbling the ball, at the last moment he gathers it up and propels himself backward while simultaneously morphing into jump-shooting mode. It might be a travel, but it happens so fast and there are so many moving parts that it's virtually impossible to detect with the naked eye. Durant is off-balance and can't recover in time. On average, the Harden step-back creates about 6 feet of shooting space, per Second Spectrum data. By the time Harden brings the ball through his shot pocket, the defender attempting to close the gap is always too late. Check out that last still shot. 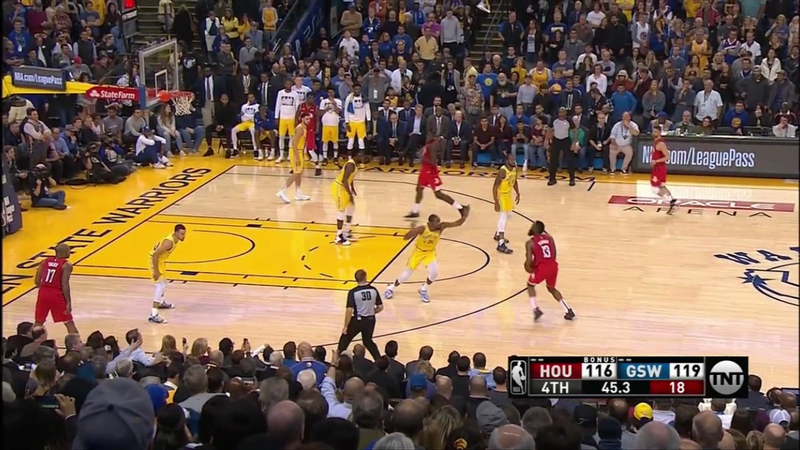 It looks like a teammate set up Harden for a standard catch-and-shoot 3. But this space was created by the shooter himself, and that's what makes it so damn dangerous: Harden can create clean 3-point looks at will. Depending on what you consider to be the beginning of the act, Harden's step-back jumper takes about one second. In that second, he breaks his defender's balance, creates the shooting space, brings the ball through his shot pocket and releases it. It's the most dangerous second in the NBA, and although defenders know it's coming, they don't know exactly when. At T minus 1, they're still clueless that liftoff is already happening. Despite the fact that Durant's wingspan is enormous, despite the fact that he was Harden's teammate for years in OKC, despite the fact that the stakes were so high, and despite the fact that we all knew what Harden wanted to do -- it didn't matter. He did it anyway. He tied this Jan. 3 game with the step-back 3. The Rockets ended up winning in overtime. As Harden proved that night in Oakland, the step-back 3 is our Most Valuable Player's most valuable play. Here's a stat: At 29 years old, Harden is the NBA's all-time leader in unassisted 3s. This says just as much about his bewildering greatness as it does about the sudden and rapid rise of unassisted 3-point shooting around the NBA. He's ahead of LeBron James by more than 100 makes. Not only is Harden an offensive savant with an uncanny ability to create offense by himself, but his prime also just happens to coincide with a time and a place obsessed with efficiency and 3-point shooting. What's happening in Houston is the perfect storm of innovation and creativity from the front office, coaching staff and superstar. The Rockets are showing us the future of NBA basketball. Luka Doncic ranks second in the NBA with 2.9 step-back 3s attempted per game this season, according to Second Spectrum tracking. Harden's at 8.0. Nobody else is even close. Why does Harden rely on the step-back 3 so much? It works! Harden's step-back 3s generate 1.20 points per shot on average -- better than the Warriors' league-leading 1.15 points per shot. A hypothetical offense consisting solely of Harden step-back 3s would yield points faster than the best offense on the planet. Yeesh. Harden would thrive in any era, but he's particularly well-suited for one in which perimeter contact is illegal, traveling enforcement is meek and 3-point shots are the holiest act in the league. Over the past decade, the game has changed. Not too long ago, offensive tactics were designed to create good looks near the hoop. Now space 24 feet away really matters. It's an ongoing metamorphosis, but while the rest of the league is still trying to comprehend its own transformation, our bearded butterfly down in Houston is already flying away with scoring championships and potentially his second MVP. About 83 percent of NBA 3s are assisted. After all, jumpers from that far away are hard. Even the league's most talented 3-point specialists require a clean workspace to hurl the dang orb through the ring at acceptable rates from that distance. As great as dudes like Klay Thompson or Kyle Korver are, they still need a balanced base and open space. 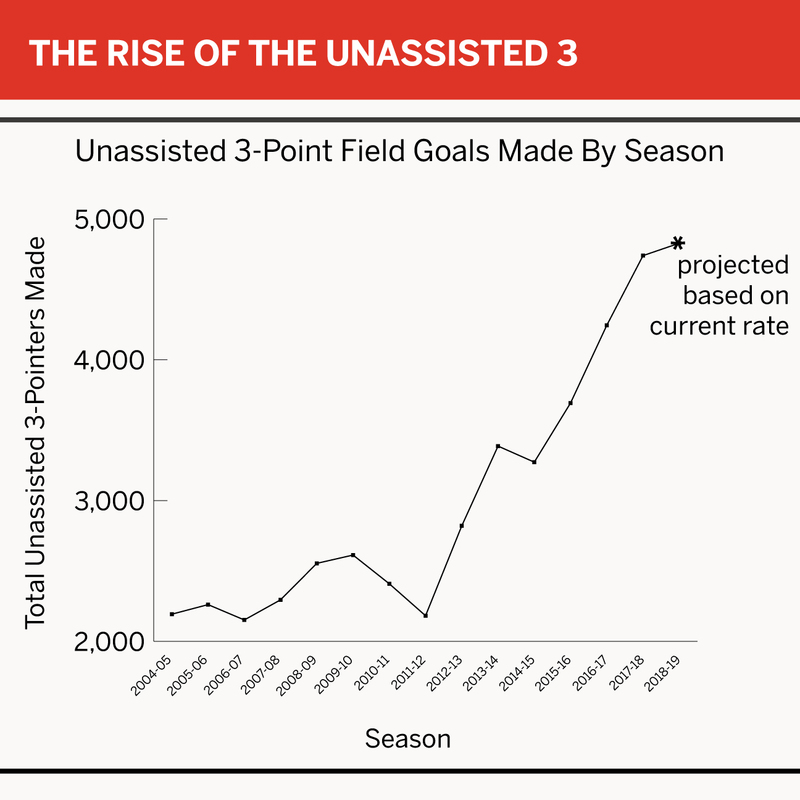 In turn, this decade's rise in 3s really meant the rise of the catch-and-shoot 3. Offenses began decorating the outside edges of the scoring era with more and more threats while devising strategies to create clean looks for those guys. As a young player in Oklahoma City, Harden's 3-point approach was basic. Over 85 percent of his triples were assisted back then. Once he entered the Daryl Morey ecosystem in Houston, the conventions started to erode. 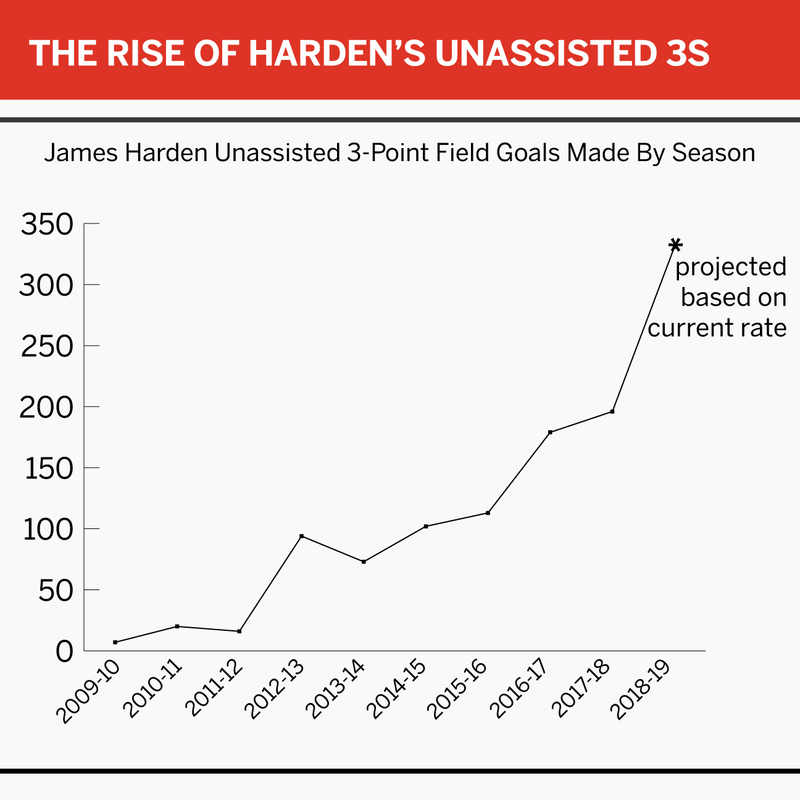 In his first four years there, the assist rate on his triples hovered around 50 percent, and Harden starting getting comfortable dribbling into his 3-point tries. Still, under Kevin McHale, Harden could never really let his freak flag fly. In D'Antoni's first season, Harden's green light got much bigger. He cracked 100 step-back 3s for the first time, and suddenly less than a third of his 3s were assisted, per Second Spectrum tracking. Last season, that assist rate dropped further to 26 percent. So far this season, it's under 14 percent. Here are the top three seasons for unassisted 3-point makes in league history. Harden's jab step tempts his defender's body backward toward the basket, but Harden isn't going that way. That initial move is a red herring. His back foot is still as a statue, marking the location of the future jumper. 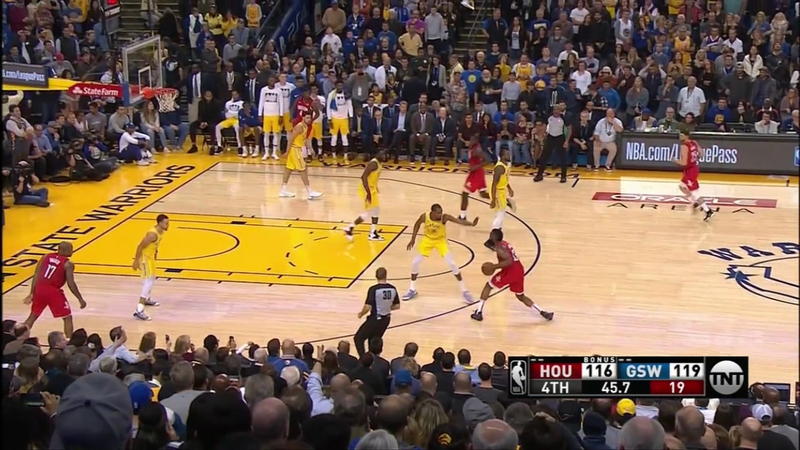 His stance widens, and just as his defender's mass is fading toward the rim, Harden propels his own backward off of that jab step toward his back foot. As the two feet reunite, he's already commencing the launch function. Harden simultaneously gathers his final dribble and brings the ball through his shot pocket and up to his release point. Through the lens of the league's player tracking system, the Harden-Durant encounter looks like some weird demonstration of particle physics. The bearded particle first tricks his man into thinking he's driving before yanking backward straight into a 3-point jump shot. 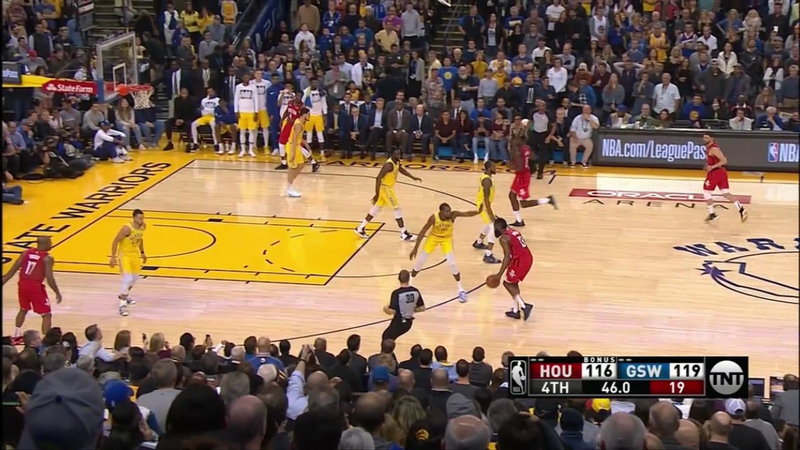 At the exact moment Durant is the farthest from him, Harden already has the ball in his shot pocket, ready for launch. Durant desperately tries to recover and close out, but it's too little, too late. Another unassisted 3 gets its wings. Here's a key caveat: The whole thing works because defenders like Durant have to honor the drive. Harden's jab step is terrifying because it presents a real threat in ways that, say, Buddy Hield's does not. Many 3-point specialists' jab steps don't scare anybody. Harden is arguably the best attack guard in the league. If you don't honor his jab, he'll blow right by and score at the rack. In a weird way, the implicit threat of Harden's drive is the biggest feature of his step-back 3. JJ Redick or Reggie Bullock couldn't do this. It's no coincidence that this wild explosion in unassisted 3-point offense is happening in Houston. More than any other team, the Rockets quantify their own productivity and try to find ways to hack their own offensive efficiency rating. Triples have long been the most visible method for that approach. However, Harden's unprecedented volume of step-back 3s is proof the Rockets are still tinkering with their philosophy. Their front office and their coaching staff deserve credit for being open-minded and embracing a tactic centered around what many would've labeled a bad shot just a few years ago. Many teams still do. There are sure to be copycats, but man, this isn't easy. Even the best basketball league in the world isn't teeming with fellas capable of draining hundreds of 25-foot step-backs per season. Still, some are trying. Doncic, Damian Lillard and Devin Booker aren't blind. They're all seeing what we're seeing. So are their coaching staffs. Durant, Kyrie Irving and Steph Curry are watching, too. Harden may be the prophet showing us that perimeter isolations are an offense unto themselves, but he won't be the last. If you love do-it-yourself iso 3-point shots, you're going to love the future of the NBA. The unassisted 3 is the emergent shot of the moment. It's no surprise that Morey, D'Antoni and Harden are the main characters in this story. They're the space force from Space City, winning the offensive arms race with newfangled weaponry we've never seen. Once again, they're the harbingers of future basketball.